There are a number of worms or worm-like creatures, such as tent caterpillars, that can affect lemon and other citrus trees. While “tent worms” are not harmful to lemon trees, others such as the larva of swallowtail butterfly or cutworms can do significant damage. While pesticides can control many types of worms, they may also harm bees that pollinate lemon trees. Instead, drive off worms with a natural insecticide. Mix insecticide soap with water in a bucket according to the directions on the back of the package. Hand-pick worms or worm nests off of trees and throw them into the bucket of soapy water to kill them. Pour insecticide soap into a spray applicator that attaches to the end of a garden hose. Use the hose and insecticide applicator to spray insecticide onto the leaves of your lemon tree and into worm nests to kill worms. Reapply every seven to 10 days unless otherwise specified on the insecticide soap label. Release parasitic wasps such as trichogramma around your lemon trees; hang cards filled with the wasp eggs in the branches of the tree with the hangers that come with the strips. Wasps typically come on cards of 4,000 eggs that have been frozen into stasis. The wasps will hatch and consume the eggs of worms. Mix six cloves of garlic, 1 tbsp. of liquid detergent, 1 tbsp. of red pepper powder and 5 cups of water to create a natural insecticide. Pour the solution into a spray bottle. 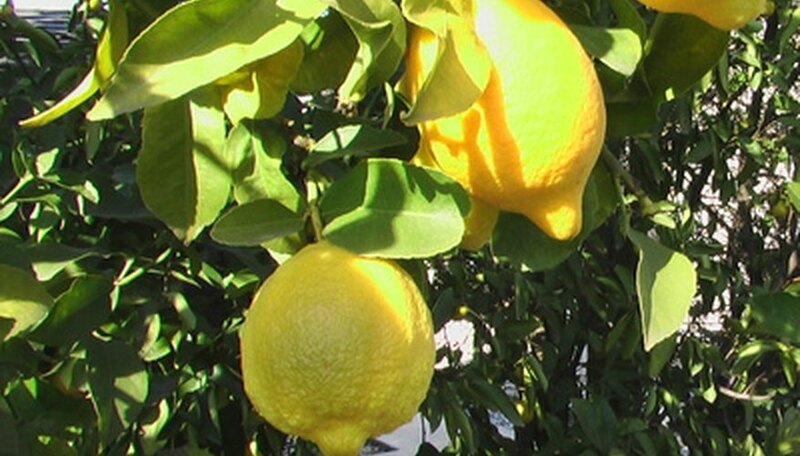 Spray the solution over your lemon trees, making sure to cover the foliage evenly. This spray acts as a preventative against worms as the larvae will avoid the leaves coated in spray. Repeat every seven days. Wear gloves when handling natural insecticides. Insecticides containing red pepper may irritate your skin as well as your eyes, nose and mouth upon contact.